In this installment my dear friend David Baldwin, a high school teacher and savant-esque instrumentalist invites us to bask in the glow of his love for English popsters XTC. XTC is not a band one just falls into. It takes some effort to become an XTC fanatic. In fact, for many, it takes too much effort. A majority of their catalogue can be somewhat jarring, especially juxtaposed with the mainstream- you know, songs with traditional chord changes, the avoidance of dissonance, and easily-grasped hooks and choruses. Early-to-mid XTC is at times brash, dissonant, and frenzied. These characteristics alone might hold an appeal in and of themselves, but what really cements them as a great band is the way they managed, over time, to channel and wiggle that energy into some of the most delectable and beautifully-chorded harmonies ever put onto record. They are a group that musicians and music addicts alike might refer to as “a bands’ band,” considering their influence runs deep in the world of rock n’ roll, even if so many casual listeners will never know it. Thankfully, I’m no casual listener. I was a latecomer to XTC. I was two weeks old when they started recording their debut album in 1977, yet my introduction to them came in 1992 when I heard “The Ballad of Peter Pumpkinhead” from their superb “Nonsuch” album. For many, that album might be a good place to start. It is an aural concoction of melody and harmony, orchestral flourishes, acoustic, and electric guitar tones and textures sprinkled throughout, and injected with that trademark XTC oddity and energy. Yet most of it is traditionally structured enough for a new listener. I remember going into the ill-fated Blockbuster Music store back in the 90’s- a place in which customers were encouraged to unwrap and listen to CDs (probably before leaving to purchase them somewhere else at a better price.) I remember spending one afternoon here exploring Black Sea, Go 2, The Big Express, and Oranges and Lemons, the album covers of which had caught my eye, but except for a couple perfectly-crafted pop singles, ("Mayor of Simpleton", for one,) I found them confusing, unsettling, and strange. (“Why does the singer hiccup and growl out the melody? Are they intentionally playing those clashing notes?”) Later, after spending the appropriate amount of time exploring their quirkiness and craft, I came to recognize- and adore- the appeal of these and indeed of every one of their records. It should be said, making a 60-minute playlist was an extremely difficult task. I started by quickly choosing some “essential” tracks and, alas, it came in at 2 hours. I also did not include anything from two of their albums: I find Go 2 to be their weakest album due to a combination of sophomore slump phenomenon and a potential identity crisis. Interestingly, I didn’t include anything from Skylarking, the album widely regarded as their masterpiece. I wasn’t planning it; it just worked out that way. I figure I disagree with those critics who decided it was their pinnacle, but it’s a great album in it’s own right. (Many casual listeners will have already heard “Dear God.”) Thankfully, I didn’t have to consider the Dukes of Stratosphear, their alter-ego, or I never would’ve made it through the selection process. The truth is, getting into XTC takes time. If you want the stuttering post-punk squall, few bands can match the early, touring years of XTC. If you want harmony and songcraft, go for the later, studio years. My favorite XTC years are pretty much all of them, as all the stages and elements of XTC are part of the whole and add to what makes them great. Probably the first track of theirs I heard and as good a place to start as any, with the beauty of an electric guitar, naked and chiming. The instrumentation adds layer by glorious layer: drums, harmonica, bass, and the melody and metaphor of Andy’s voice-and-words. By the time the guitars layer on top of themselves, the chorus harmonies, tambourine, organ all weave in and out...it’s a thing of unparalleled rock n roll beauty - a ballad that could go on forever. A timeless masterpiece. Jumping back to the beginning, this spastic number comes from XTC’s debut album. Its raucous punk energy somehow doused with a splash of Britain in the 1950s. Barry’s staccato Wurlitzer, Andy’s yelped and hiccuped vocals... and it might be described as punk rock proper. (Sure, I know it’s 1977, but did he just say the phrase “with whom?”) The chorus in all its giddy ridiculousness and firecracker handclaps (woo hoo!) is shimmy-worthy. A personal favorite, this song manages to perfectly capture, both lyrically and musically, the nervous energy that comes with falling for someone. It’s from their third album and the first featuring Dave Gregory on electric guitar. It is guitar pop brilliance. From the first album released after they stopped touring, this track is a pastoral example of how XTC uses acoustic guitars in their aural palette. It also showcases Andy’s knack for storytelling, while still writing from the heart. And, as usual, it’s got a great bridge. Such simplicity in instrumentation: acoustic guitar, piano, cello... it’s a hauntingly beautiful song; The lyrical content- particularly spelling out swear words- might seem childish were it not so clearly meant in earnest and thus painfully personal. Andy’s bitterness is chilling. And yet it still ends on a hopeful note- resolving with a bridge that Brian Wilson himself would be proud of. A collection of outtakes, rarities, and soundtrack songs, Buffet contains some real gems, including this beautiful, loungey piano-driven Colin Moulding-penned B-side. I believe- to some extent- a band can be judged on their b-sides. Written circa 1983, everything but the drums were re-recorded in 1989. The piano-playing is lovely, but the guitar fill/riff ties it all together with ribbons of electric guitar strings. Oh, the axework! The clamor! The bucka-bucka! The bold irreverence of the lyrics! The Beatlesesque horn break, the vocal harmonies! I can’t imagine not including this song. With the exception of maybe “Mayor of Simpleton,” this may win most-singable chorus on that album. 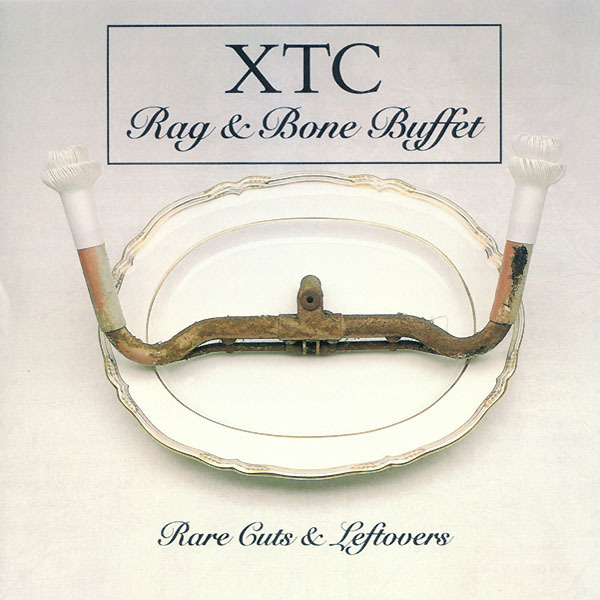 My favorite XTC single of all time, it is perhaps the track that best captures the perfect blend of bombast and pop that characterized XTC in their touring years. Who would’ve thought that a whistled melody echo and a hummed-along counterpoint on the chorus could be used to such satisfying effect? The tumble thump snap of the drums clatters along like a machine in high gear. The guitars alternately chiming and then locking like gears….Come to think of it, in the 1970s and into the early 80s, it might as well have been XTC rather than BMW using the slogan “the ultimate driving machine,” as the Terry Chambers / Colin Moulding rhythm section was unstoppable. Originally a B-side, this song about Great Britain is awash with Defoe-inspired island imagery. Like a beach holiday, the boys in the band are clearly having a blast here, and it shows. It also showcases their versatility as a band. (Is that a bandoneon?) Incredible musicianship from such a relaxed-sounding bunch. I will inevitably sing this the whole work week after hearing it. A slow-burning rocker recorded in 1980. Never before this had XTC shown such restraint, such controlled power, such intensity, and such openness and space. They sound downright huge in this track. The arpeggiated guitars and the rumble tumble of the drums- punctuated with dramatic pauses and crashes- ultimately build to a tempestuous climax. And the lyrics here, about feeling powerless due to the fallibility of language, really resonate. Arguably their most consistently solid record, English Settlement brilliantly nestles Dave and Andy’s acoustic and electric guitars into the rolling chassis of the Chambers/Moulding rhythm section. The intricate clockwork of the guitars, the droops and swoops of the bass guitar, the swaying lull and swell of the “why, oh why” harmonies...this is a classic. And, as usual, there’s no shortage of metaphor in Andy’s lyrical library. Also, nice use of the jingle bells. Some of my favorite lyrics of all. For this track, Andy returns to one of his favorite themes- dealing with wounded pride- and his under-the-bigtop imagery really works. There is an engaging thread of humor (and sincerity) ever-present within Partridge’s songs. Musically, this one is straight-forward, it’s a simple pop song with a few perfect chords thrown in and absolutely top-notch production. And, in true XTC form, the song’s bridge is musical and lyrical perfection. In this song it just sounds to me like they flit up and down the frets grabbing handfuls of guitar strings and plucking ‘em, like they’re plucking feathers out of the metaphorical hypocritical melody bird. It’s just great. One of their biggest hits, and I had to include it. The catchy, self-deprecating lyrics will forever hold a universal appeal. The arrangement is likewise superb. Moulding’s walking (or rather hastily jogging) bassline cycles throughout the song with gorgeous precision. The real brilliance shines through the chords and melody. This is XTC’s perfect pop song. Love those chimey guitar tones. I feel it would be wrong not to include this, from this electric successor to Apple Venus. Really, it’s two songs joined at the hip. The “Maypole” section is what really pushes it into my list. It’s a rollicking stomper with some wonderfully melodic guitar handiwork. And the round-and-round counterpoint harmonies and figure-eight guitar lines at the end of the song gallop us off into the sunset. David Baldwin teaches German and English to the high school youth of America, and has plied his myriad musical skills in a number of different bands including The Pantones, a band that he and Matt Carlson (the founder of Wax & Wane) have been in together for more than a decade.